BERLIN, GERMANY / ACCESSWIRE / September 21, 2018 / Imagine owning a store and having some spare space on your wall or maybe even an empty shop window. Wouldn’t it be appealing to generate passive income by just setting up a display and monetizing it? With HYGH this is now possible; Anyone can set up a display, connect it to the platform by downloading the app and generate revenue! In today's time where internet and technology enable high connectivity amongst people, brands still try to search for new ways to share information, sell an idea and most importantly to create a powerful impact within no time. This has given rise to innovation and creative marketing techniques which results in influencing a large population at the same time all around the globe. Digital out-of-home advertising has become an eye-catching and impact-effective source. The sole purpose remains to not only grab the attention of the audience but to convince them of what they see on those digital screens. These Digital screens enable a whole new way of communicating with people who are on the go, and it has undoubtedly become the latest trend in the world of advertisements. Talking about the current scenario, the digital screens are only available and affordable for high profile brands. Furthermore, the number of screens is limited. 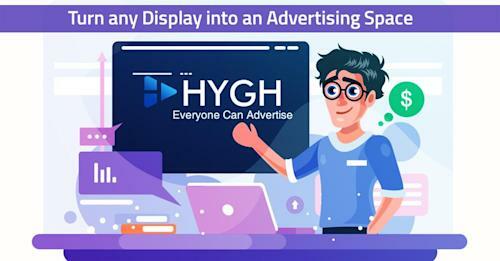 HYGH aims at building the bridge between all advertisers and display owners regardless of how big their brands are, and the size of the screen network owned by them. HYGH can transform every screen in the world, including tablets, televisions, and Digital billboards into highly flexible advertising spaces. Anyone who owns a publicly visible screen can easily download the HYGH software on their device and pair it with the HYGH platform to generate a passive income by letting advertisers run their campaign on it. The advertisers, on the other hand, can book displays in near real-time and run their campaign on the screens selected by them within the desired radius or area. They can also pick specific time slots for their advertisement to be played, which in return helps them to target the right audience. HYGH simplifies the booking process for the advertisers. They only need to register in the system, create a campaign, search for displays and the campaign is good to go live. HYGH is all set for conducting a Security Token Offering (STO), starting this November. You can buy tokens during the crowdsale , then hold, or trade them later on. HYGH being a security token rewards 9% of every transaction quarterly as a dividend to the token holders. HYGH ensures that every party involved in the ecosystem derives its maximum benefit from it. After the advertisement has been booked, 83.5% of the cost is shared with the display owners, 2.5% goes to the HYGH community for moderating the content and screens, 9% of every transaction is rewarded as dividends quarterly amongst the token holders. HYGH itself retains 5% which is used for maintenance and reinvesting into the company’s growth. HYGH is building a globally distributed ecosystem which not only ensures good revenue for everybody involved in the network but also facilitates an increased public participation. Advertise anywhere easily or provide a display and get paid. The project will conduct its pre-sale from November 2018.